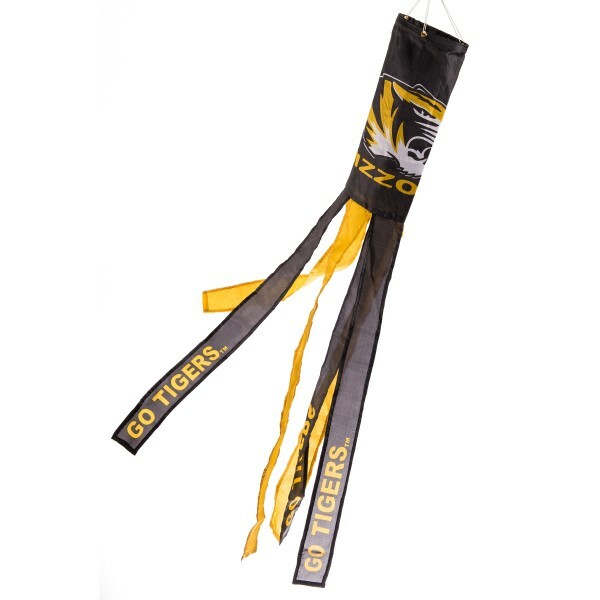 This Wind Sock for Missouri Mizzou Tigers with six (6) alternating colored tails and streamers is constructed of 100% polyester and measures roughly 40 inches in length with a top bridle diameter of 5 inches. Each windsock includes officially licensed school logos and names which are screen printed into the wind sock and three (3) streamers include team names or slogans as shown. In addition, the windsock is double stringed and includes a rotating hanging clip, for easy setup. College Windsocks are a unique way to display your team spirit by hanging from your front or back porch, patio, mailbox, or flag pole! Our Wind Sock for Missouri Mizzou Tigers is perfect for home decoration, tailgate parties, and makes great gifts for relatives, neighbors, or yourself.